This is advice given by the American physician-instructor of my monthlong Global Health internship in Ghana. My two pre-med peers and I have just told him we are not comfortable participating in his experiment: leading our team of interns into a rural community, unannounced, to collect health data on children. Where is the informed consent? Do our subjects really have the ability to refuse to participate? Would we have done something similar in any community in the United States? I’m standing on the balcony of the hilltop hotel I’ve been living in for the past three weeks in the coastal area known as Anamabo. I replay his words in my mind, staring down at a landscape of green palm trees and cinderblock houses beside the dusty teal ocean. Confused about what good is being done to begin with, I am reminded of my first experience in Ghana. The year before, I took part in a 10-day medical mission with this same global health NGO to deliver medical care to a developing community. The experience left me with serious questions about the nature of global health and the role of unskilled “medical volunteers” overseas — questions a 10-day trip could not answer, questions I had hoped a one-month internship might help me address. But I have not found answers on this internship. I have instead traveled deeper down a rabbit hole that forces me to ask more questions and challenge the role of pre-health volunteers in global health altogether. 1. 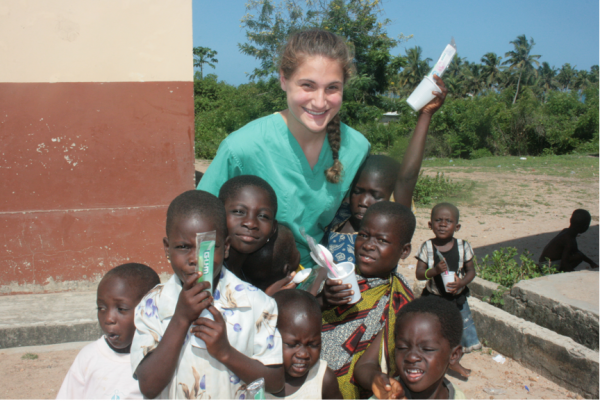 What do short-term medical missions teach pre-health students about global health? On the first day of my medical mission, I’m standing in the room used for water storage at a children’s school. A nurse hands me a speculum doused in lubricant and gestures toward the patient in front of me, an anxious woman lying—knees up—on the rough wooden teacher’s desk. We don’t know the patient’s name. We don’t know her medical history. She is not briefed on the details of the exam. She has not given consent to be examined by an ill-trained volunteer. She is only told that she should have this exam by the Ghanaian interpreter. My scrubs are clinging to the backs of my sweat-soaked knees. As a pre-medical student, I have played the role of a shadow behind dozens of physicians. Throughout these many hours of observation, I have stood back, eager for the day I will be able to use the skills I will learn in medical school to attend to those who are suffering. But here I am, unexpectedly being asked to take on this role much sooner. “Do I have to do this?” I think to myself. The nurse seems to read my mind as she nods and waits for me to insert the speculum into the patient’s body. I am told that “providing medical care to the poor requires improvisation.” Is it true? Don’t the poor deserve the best treatment? 2. What are the risks to the patient with this work? “I can’t get his blood pressure!” Katie says to Dave. But what if the doctors give anti-hypertensive drugs to healthy patients because Dave wrote down too high a number? What then? 3. What do short-term medical missions teach pre-health students about patient care? My friend Matt rushes in. “There’s a guy with polio in there! You all have to check it out!” he says. I walk to the doctor consultation station, past the adult patients who sit patiently on the red cement curb, still waiting to be seen. I am late to the gathering, but I do not see a male patient. I only see a herd of my peers, with their cameras framing their eyes and something below them. I realize their specimen is the man’s leg. I stand on the tiptoes of my left foot and then my right, trying to see something. Is the man okay? A tiny space opens between two fellow students, and I meet the man’s gaze as he sits, powerlessly, in his chair. Beside him, the doctor gazes passionately into his “Tropical Disease” handbook for beginners. The room echoes with loud voices I cannot understand. The voices, the camera flashes, the stench of body odor, and the stifling humidity swirl into a tunnel of discord. My colleagues snap and snap and snap photos. It is a photo-op: a safari of medical tourism, where the patients are the scenery. Is the imagined distance between us and them only increased by medical missions, rather than decreased? Are we dehumanizing those we seek to serve? 4. Why did I come here? Can I really save the world? The months leading up to the trip were filled with information sessions held by my university’s chapter of this global health NGO. During our meetings, we gathered and counted medications and supplies and had conversations about what to expect overseas although none of the brigade veterans had ever been to Ghana. “This will be one of the most rewarding experiences of your life!” my biochemistry lab partner, Shannon, said. The chapter president spoke proudly about how the organization is “sustainable, holistic, and ethical” and how we would “change peoples’ lives” through participating in this trip. One advertisement for the trip, on display in the student union, even read, “Save children in Africa this summer!” I looked through thousands of photographs of my peers who had been on trips, smiling with children of the developing communities they had worked in. I considered these photographs to be true representations of the positive impact they were having in these communities. No one challenged my decision to take part in a medical mission. Rather, I was praised for my decision; my peers and family begged to see pictures and hear all of my stories when I came home. Should pre-health volunteers be encouraged to go on short-term global health brigades? Or is health volun-tourism simply a new form of colonialism? Desperate to find answers and reluctant to give up a passion to promote global health equity, I went back to work with this NGO in greater depth. Like many others, it aims to empower both student volunteers and the community members these students work with, while improving access to healthcare and strengthening local systems. These are, of course, admirable intentions. It is without question that the majority of student volunteers feel empowered through these trips. Most of my fellow interns had been on multiple brigades to Central America; they were enthusiastic to work with different cultures and eager to have an impact. Undoubtedly, these students had become activists for global health equity. Furthermore, it is true that such organizations increase access to healthcare. The communities this organization works within, for example, host medical brigades every three months in partnership with a different American university chapter. However, through the research three of my peers and I conducted during this internship, I came to find that simple access does not guarantee high-quality care, nor does it lead directly to positive outcomes. While short-term medical missions inspire young adults to serve as advocates for global health equity, such trips can generate a flawed understanding of the ways in which the challenges of global health should be addressed. I often heard my peers describe their plans to go back to work with this organization as fully trained healthcare professionals on short-term missions in the future. Although this desire is well intentioned, it suggests a belief that the multitude of problems that are blanketed by the term “global health” can be treated with a ‘quick fix’ model. On the one hand, students learn that causes (and preferred treatments) of illness are multifactorial and inextricably linked to an individual’s environment, socioeconomic status, and cultural views. Yet simultaneously we experience a medical model in which hundreds of untrained foreign students pass through a community every year (many of whom have never set foot in that country at all). We are taught to believe that such a model is a respectable effort to promote and sustain the health of the world’s poorest citizens. The short-term nature of medical missions seems ideal for allowing student volunteers to feel inspired without seeing the challenges of global health work. We swoop in, taking in sights and sounds, snapping hundreds of selfies with local children, and participate in healthcare tasks we are ill-trained to complete. Then, all too quickly, we swoop out, feeling self-satisfied with our efforts. Such a model serves student volunteers while undermining the problems of the world’s poor, as well as the efforts of individuals who dedicate their lives to the work and advocate for a more humble, and sustained, partnership approach to global health. Such perspectives echo those of medical colonialists and imperialists alike, who believed that the issues of the developing world stemmed from its simplicity or primitiveness. They are also rife with a rescue mentality—that people in impoverished countries need (and want) to be saved. Wearing medical scrubs and stethoscopes around their necks, pre-health volunteers are passionate about working in impromptu clinics. Yet the care that is carried out by these unskilled students is problematic at its best and life-threatening at its worst. When I spent the day screening women for cervical cancer, I was lucky not to have made errors. I did an injustice to the women of the community I thought I was serving by virtue of reinforcing the facade that I (with my scrubs, stethoscope, and affiliation with the American doctors) was qualified to be examining patients and handle an emergency if one were to occur. When unskilled students take a patient’s vital signs, there is a risk that health abnormalities might be missed or falsely assigned to patients. These patients are given medication to treat both acute and chronic illness—medication that might be necessary for someone with a serious condition that goes unnoticed; medication that could be life-threatening to individuals who do not have the indicated illness. Furthermore, organizations, such as the one I worked with, can inadvertently establish parallel competing systems of healthcare between themselves and other NGOs, as well as with the country’s existing health system. For example, in my internship research I learned that many patients avoid purchasing government-subsidized health insurance and using government health services because they depend on the free services of the American clinics. These individuals are not told that the organization plans to exit the community after an unknown period of time. We need to reevaluate the standard of care for treating the world’s poor through global health initiatives. Borrowing from ideas of liberation theology, Paul Farmer advocates for “a preferential option for the poor.” Indeed, we owe a level of “perfection” to the communities we are so passionate about and eager to serve. We owe these individuals narrative and cultural humility: notions that may help challenge the way we speak about or for them. What’s more, we do not owe these individuals our service if we do not have a skill to offer them. Would unskilled pre-health-oriented students continue to go on these trips if medical, nursing, therapy and other graduate admissions committees no longer condoned them or considered them to be valuable experiences? Short-term global health brigades are harmful—to students, to patients, to communities, and, ultimately, to healthcare as a whole. It is a model that deserves to be challenged. It is a model that deserves to be changed. After all, not only do we owe the world’s poor our very best practices. We owe ourselves that as well.